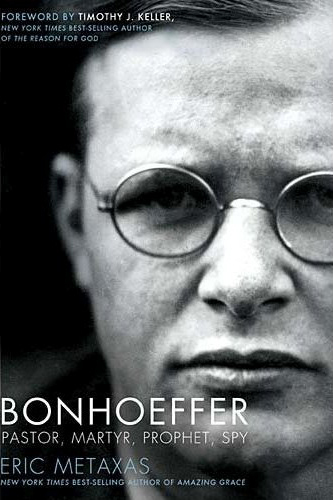 I finished Metaxas’ Bonhoeffer biography a few days ago. One of the things that will stay will me is how adamant Bonhoeffer was that the church stand up for Jews in Germany in the 30’s. The church couldn’t just say, “those being persecuted are not Christians, so its not our concern,” because for Bonhoeffer, the church was an institution which by definition existed for others. To “speak up for those who cannot speak for themselves” (Proverbs 31:8) was intrinsic to the church’s identity. Thus, in the face of increasing pressures towards anti-semitism, Bonhoeffer declared, “only he who cries out for the Jews may sing Gregorian chants” (281). Sadly, most other German Christians – including many in the Confessing Church – didn’t seem to share this view. They may not have approved of all Hitler was doing, but they also didn’t have courage and clarity in opposing him. They were muddled, they were divided, they were self-interested, they were hesitant. Again and again throughout the book you keep waiting for the German churches to say “enough is enough” and to move from the realm of talking and denouncing and into the realm of active resistance. Its saddening and humbling that most of them didn’t. Bonhoeffer was different. He saw early on how dire the situation was, and how completely useless half-measures and talk were. He acted. He stayed in Germany at the clear sense of God’s call and eventually got sucked up right into the middle of assassination attempts. He fought. At one point I wrote on the back inside cover (where I take notes): one of the benefits of this book is seeing afresh that there are times when it is good to fight. Its easy to be a pacifist in the suburbs. When confronted with evil, there are times when all of out warfare is the only legitimate course. From reading this book I am motivated to do what I can with my life for the issue of abortion. Like Bonhoeffer, I want to spend my life fighting for the lives of those who cannot fight for their own. I want my life to be a force for good in the world, not just a moderate, neutral force. May God give those of us who serve in his church the courage and the clarity to fight evil with the weapons of the gospel as God leads us.